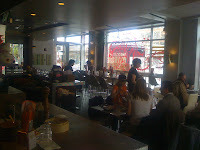 Ok, so I didn't actually spend my afternoon with Joanne Chang herself, but I decided this morning to wander over to the South End and check out her two restaurants. 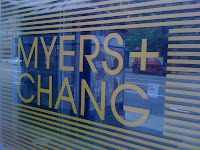 First, I swung by Meyers + Chang to have lunch. The restaurant struck me as a little bit like P.F. Chang's but more laid back and a little edgier. Meyers + Chang is an Asian fusion restaurant that seems to have elements of Chinese and Vietnamese influence in its dishes. I asked the waitress what she recommended and unfortunately everything she named had pork in it (I don't eat pork) but I settled on three dishes that looked pretty good. 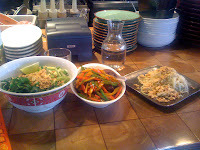 A green papaya slaw appetizer ($5), the dan dan noodle salad ($8), and the rainbow beef ($13). The papaya slaw was a little lacking. I couldn't quite place it, but there was something missing. Some flavor was missing so it didn't taste quite right. 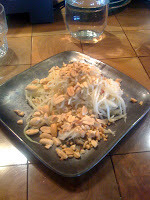 I regularly eat the papaya salad at Xinh Xinh in chinatown, it's spectacular there. 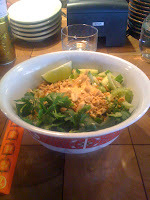 The dan dan nooldle salad was quite refreshing. It resembles the cold noodles you can get in chinatown with a few additions: romaine lettuce, slices of celery, and some cilantro. I've never had noodles with lettuce, the crispness of the vegetables added to the dish - I was pleasantly surprised. 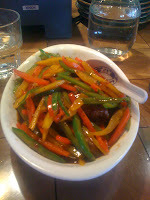 Lastly the rainbow beef was essentially beef stir fried with red, yellow, and green bell peppers. It also had good flavor. Be sure you like bell peppers though if you plan on ordering this dish - it comprises about 80% of the dish. 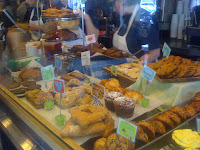 After lunch, I continued my trek down Washington Street to get over to Flour, Ms. Chang's bakery. I had walked past it a few times before but it was so packed that I didn't bother to go in. This time I went in. I asked what was most popular and was told to try the sticky buns. So I had a sticky bun and a slice of banana bread. 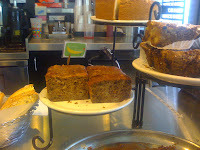 The banana bread was moist and full of walnuts and delicious, delicious banana flavor. The sticky bun was also superb. Chewy and sweet, smothered in caramel and toasted pecans. I think I gained a few pounds just over lunch. But, it was so worth it. My hat goes off to Chef Chang. The food at both of her establishments was delicious. PS. 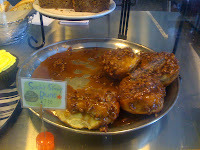 Click (here) to read an interview with Joanne Chang as well as the recipe for her sticky buns. 1 Response to "My Afternoon WIth Joanne Chang"